Valhalla Calling: The Judges Have Ruled…and You Can Vote! This is the moment many of you have been waiting for—the moment when we announce those who have made it into our final five. The moment when you can read each pitch and vote on it. The moment when YOU can help us decide who should be called to Valhalla! Our esteemed panel of judges read and debated over the pitches, and now they’ve narrowed down the options to five, which you can now read. Before we jump into the pitches, we want to take a moment to thank all of those who submitted a pitch. 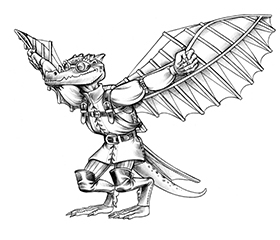 YOU are what made this contest such a fun and interesting one, and everyone at Open Design and Kobold Press thanks you for the time and effort you spent on crafting your pitches. Now, without further ado, here are the final five as chosen by judges Wolfgang Baur, Brandon Hodge, Ben McFarland, and Wade Rockett. They are presented in alphabetical order by the pitch’s author’s last name. A Pathfinder adventure for 9th level characters. “bon’speranza’ – Don Ziphero Casafiore. A noble Bibliotoro of Triolo, Don Ziphero was infamous, hated, admired, notorious. A gambler, expert dancer, tutor of young women, roué, charlatan, doctor, novelist, and publisher – no few of his books being put under the Black Ban and locked in the vaults of the great library – he left no wife – though many lovers – and no acknowledged heir – though many namesakes and no few uncanny doubles scattered among the populace, both high and low in birth. None were named in his will. Instead, his estate belonged to anyone who passed a single evening, night, and morning, within his ramshackle palace on an island outside Friula. Many hoped to win his extensive lands and his collections of priceless volumes, art, and magic, and many sought the friendship of the old reprobate as he lay dying in his vast bed. So convinced were some that he had chosen them that duels broke out at the reading of his will, and rivalries still boil beneath the surface of the Bibliotori. Most who have dared to enter Casafiero have perished or vanished. None have survived unscathed. What seemed wit now seems a cruel joke, and the name Zephiro has come to signify revenge beyond death in the lore of fair Friula. The Seventeen Steps consists of the seventeen rooms of the decaying palace, studded with shifting spaces, secret passages, deadly automata, illusions, extradimensional spaces, and thousands of books – some more dangerous than they might seem, sleeping on the sagging bookshelves. The waters – and denizens – of the bay of Friula have seeped into its lower chambers, while deep within the palace, the masked and embalmed Don Ziphero awaits his occasional visitors and victims. Triumph over the cunning of the master of Casafiore offers many secrets, wealth enough to achieve great works of magic or conquest, and fame beyond measure. Fail, and enter the ledgers of the lost and forgotten: the numberless victims of Zephiro’s last jape. A Pathfinder RPG event-based adventure for Level 10 characters with options for Mythic play. Frost falls. Life fades. Winter comes. Jezebel schemes. Queen Urzula is the pride of Krakova. A symbol of purity and aspiration for women. A perfect target for the Princess of Poison Winters. This adventure provides the GM with a sandbox of events and set pieces throughout the City of the Mermaid weaving a tale of horror and hope over the span of a Krakovan winter. From the Day of First Frost through the Melting of the Last, the PCs, newcomers or residents of Krakova, unravel the plots of the cult of Jezebel and stop the temptress from claiming the Queen for her palace in Hell. Events begin during an unexpected early snowstorm when the cult targets one of the PCs for assassination on an icy bridge over the Yoshtula River. The next day it becomes apparent that a seemingly unconnected group of the Slahta (Krakovan nobles), priests, and scholars were targeted and all but the PCs are now dead. King Eynryk’s “mice” and the PCs investigate, but aside from minor discoveries, the trail seems cold. Ghost Night brings a source of information and potential allies to the city. As winter tightens its grip on the city, a splinter clan of the infamous Black Gypsies arrives in Krakova. Distant relations of Kariv slaughtered when Jezebel was birthed, Mama Kalder leads a clan pledged to thwart Jezebel during her terrible hunts on Midgard. The PCs’ attention is drawn to the Church of Wotan and the approaching Winter Ball and only their timely intervention stops what seems to be an assassination attempt on the King by one of Wotan’s high priests, a corrupted pawn of the cult. Briefly it seems the threat has been eliminated. But when the priest returns as a huecuva during the Lantern Festival and the PCs work to save a city torn by blatant attacks and calculating temptations, they uncover evidence of a greater conspiracy still unfolding. As the last snows melt on the rooftops of Krakova, the action climaxes with the PCs stealing into Breesek Palace in a race to catch Jezebel’s high priestess before she snares the Queen — a pursuit taking them right into Jezebel’s palace in Hell for a terrifying final confrontation with the Princess of Poison Winters herself. Moor’s Museum is an extensive collection of curiosities gathered from across the known world by the Archmage Jothias Moor. Not only is it an unparalleled resource for arcane study, the collection is a testament to the archmage’s exceptional triumphs. Now, no one has seen Moor in over a week. The museum’s doors remain closed. Ominous sounds emerge from within, and fear grips the city. The ruling council seeks heroes bold enough to enter the warded halls of the museum to determine the archmage’s fate. After time to gather knowledge about the museum and the eccentric archmage, the party enters Moor’s Museum. As they explore, the party must contend with the security measures designed to keep would-be thieves out and some of the more dangerous exhibits in. This map-based adventure encourages the heroes to investigate as they see fit. They can search for a means to deactivate the security system, look for the archmage and clues to his disappearance, or contend with a band of cultists that have taken the opportunity to infiltrate the museum and loot its most dangerous treasures. The characters discover that a crafty devil, Yettetsin, manipulated the archmage with the promise of new arcane oddities, stoking Jothias’ greed to lead him astray and claim his soul. The devil has drawn the archmage through a portal into a dangerous nether realm. In his absence, the wards that contain the fell power of his collection are weakened. Unless Jothias’ is rescued, the potent energies in the museum will be unleashed upon the city. Yettetsin provides the DM with an active, visible enemy who confronts (and taunts) the party throughout the adventure prior to their final battle with him. The cultists in the museum can fulfill several roles based on a group’s play style: the comic relief of bumbling infiltrators, a dark and apocalyptic threat that can only be stopped by Jothias’ return, or even potential allies to the PCs if they are convinced that they must unite against Yettetsin. 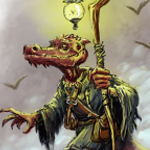 The museum and its exhibits create a plausible reason for a variety of unusual, magical creatures to be encountered throughout the adventure, along with arcane traps that must be dealt with directly or act as hazards in key encounters. Finally, there is no way to have a museum of magical oddities without an animated dinosaur skeleton or two. Consider yourself warned. For years the witches Mibella and Cissindra have terrorized the region with their black magic and vile rituals. Now, two members of the vile coven stand on trial, tied to stakes ready to burn, as they await the judgment of the inquisitors. The chill winter air is filled with cheers of joy and justice as the sentence is passed. The two witches have been found guilty and the punishment is death by cleansing fire. As the flames engulf the witches, they scream foul words, cursing the village to an eternal of bloodshed. A sudden blizzard engulfs the town square and vicious beasts attack the townsfolk. When the blizzard finally lifts, the witches are gone. Terrified by the disappearance of the witches and the curse they put upon the town, the townsfolk plead with the PCs to aid them. They ask that the PCs find the witches and end their reign of terror. The PCs’ initial lead is the townhouse where the two witches were caught and as they investigate the townhouse and overcome its challenges, they learn of a dark plot to summon the restless spirits of Hangman’s Hill, using named villagers as bait. Worse yet, the PCs learn that several of the named villagers have disappeared. The race is on to locate the witches before they complete their ritual. The PCs discover the location of the coven’s lair as well as the name of a third witch and they set off to find the witches and end their nefarious plot. Along the way they combat ghoulish henchmen and ferocious beasts as their journey takes them through dark forest and freezing moor before they finally arrive at what has become known as Hangman’s Hold. Entering the keep to confront the witches, the PCs must first overcome devious traps planted by the witches as well as the hauntings of a tragic past before finally standing face to face with the two witches and their hag sister. The final confrontation in the ruined keep will present a challenging battle against three determined opponents as well as the keep itself as the PCs’ activities risk collapsing parts of the structure. Speculation continued for many years, and rumors of the location of Charon’s treasure gripped adventurers throughout the realm. The stories changed with each excited telling, but one fact remained the same – Charon’s hoard, accumulated untouched across millennia, is among the vastest in the planes. It was not until Ka-Urur, death priest, revealed a truth to those who sought Charon’s vaults: mortals who die and remain unburied are cursed to walk the shores of the River Styx forever, and it is on these shores that Charon’s own demesne can be found. For a small share of the recovered treasure, the priest offers to poison any who come to him and leave their corpses, unburied, in his walled garden. At dawn, he would call the dead dungeoneers back to the mortal realm – and, along with them, any valuables they’d claimed. While primarily a dungeon crawl, the adventure features several roleplaying challenges and many opportunities for player interaction and character development. The module also contains brief special rules for treasure generation and optional scoring rules should the adventure be run as part of a tournament. Congratulations to each of these finalists, and thank you very much for your pitches! Now, go vote! You can pick more than one pitch when you vote, so if you like two, pick two. If you like them all, then pick them all. If only one suits your fancy, then choose one. Voting ends at 6 p.m. (Pacific) on Friday, January 4th, so go vote now! Thank you Wolfgang, Brandon, Ben, and Wade for the opportunity to be a finalist. Looks like a tough choice. I wish everyone good luck! Holy minotaurs! Well, here we are. I hope my entry elicits some interest. May the best one win! Congrats to you both, and the other finalists! The turnout was good and there were a few tough decisions by the judges. I think a few folks will weigh in with comments pro and con on the proposals, but I am saving my first comments for the Forum, most likely. Thank you, judges, for the nomination. Good luck to the others – I’d play any one of these adventures. A hearty thank you to the judges and everyone at Kobold Press for what I hope is the start of annual tradition. Seeing the other finalists’ entries, I’m honored to be among them. Best of luck to everyone. Good job everyone. Those are some compelling ideas. Wow, they’re all great . . . why not just publish them all, let us run through them, then vote? Wow, these are really cool ideas. I liked them all and would love to see them all published.